National Cervical Health Awareness Month, the recently developed HPV vaccine is resurfacing in the news. A new study predicts that this vaccine alone will decrease the number of cervical cancer diagnoses in women under thirty by 2025, according to the British Journal of Cancer. The HPV vaccine is recommended for young women and girls ages 11 to 26 to prevent HPV strains 16 and 18 of the human papilloma virus, the virus responsible for a large number of the 12,000 diagnoses and 4,000 deaths due to cervical cancer each year. Researchers claim that the number of cervical cancer diagnoses will drop by 64% if about 80% of girls obtained the vaccine, and further predicted that the vaccine decrease the number of abnormal smear tests by 27%. 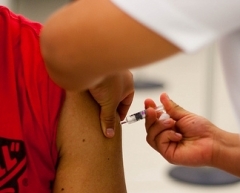 Lead author of the study, Jack Cuzick of Queen Mary, University of London, explains, "This is the most realistic estimate of the impact the vaccination program will have on the number of women who develop cervical cancer. It shows that the vaccine has great potential in preventing the disease in the near future, but also that it'll take several decades before we see its full benefits." While this is exciting news for those young women who are already vaccinated and for those who plan to obtain the vaccine, the HVP vaccine does not prevent other sexually transmitted infections and should not take the place of your annual gynecological exam and Pap smear test. Be sure to register with Body1 and login to post your own thoughts!